Christina Weaver grew up in Birmingham, Alabama in the household of a scientist and a musician/dancer. In 2011, she completed her Bachelor of Fine Arts and Painting Certificate at the Pennsylvania Academy of the Fine Arts in Philadelphia. She also attended the Maryland Institute College of Art in Baltimore from 2005-2006, and earned her Masters Degree in Painting at Indiana University Bloomington in 2014 where she received a full tuition scholarship and served as Associate Instructor of painting and drawing. At the Academy in Philadelphia, Weaver received an atelier-style art training. There she gained experience in traditional painting, drawing, printmaking, and sculpture techniques with particular emphasis on the study of the human figure. Weaver paints primarily with oils and currently works observationally and abstractly within the broad boundaries of contemporary still life. 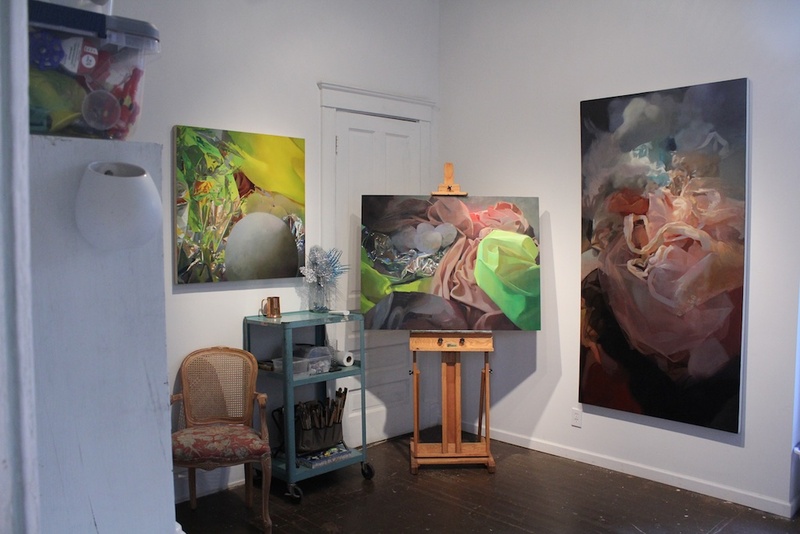 Christina Weaver's work has been featured in galleries and at various group and solo exhibitions in Philadelphia, New Mexico, Indiana, and Alabama. In 2015, her work will be featured in an Indiana University MFA exhibition at the Painting Center in Chelsea, New York. Weaver has received many awards including the Elizabeth Greenshields Foundation Grant for contemporary artists who work traditionally, and in 2012 she was featured in the Southwest Art Magazine as one of the 21 under 31: Young Artists to Collect?. Her works are part of private collections in the United States and abroad. 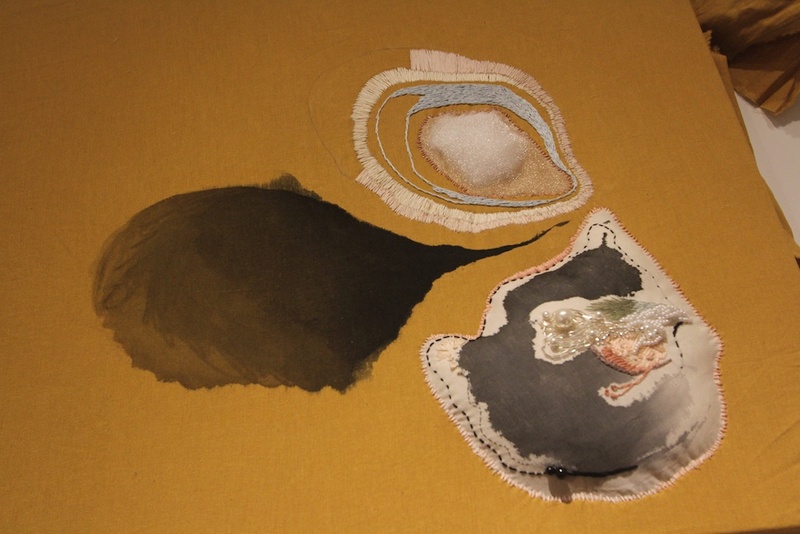 I use fabric and other decorative materials as compositional vehicles for my paintings. Though faithful representation has always been essential to my studio practice, I have been developing those moments in my work where familiar items transform into something else entirely. Lighting, ambiguous spaces, and imposed gravities confuse the identity of my subjects and blur the boundary between the ethereal and the physical. Discarded wrappings call to mind rolling terrain and tumultuous weather as they change into mountain ranges, flowing rivers, and storm clouds. At the same time, fabric folds resemble something as intimate and close as the interior tangles of the body, evoking viscera. I ask my audience to acknowledge and reconsider objects that are seen as merely ornamental, aiming to at once elevate the frivolous into the realm of the monumental and bring the viewer back to the self through allusions to flesh. My technique, compositional choices, and subject matter are informed by various artists throughout history. I admire a number of contemporary painters (Claudio Bravo, Dan Sutherland, Greta Waller, and Will Cotton come to mind), but I often find myself referring back to Dutch masters like Vermeer and Gerard Ter Borch for their technical prowess, use of light, and evident material obsession. 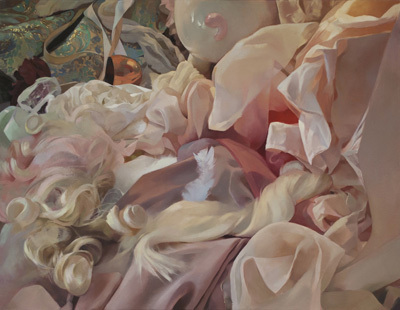 For my MFA thesis show, I was looking specifically at the anti-gravity, compositional entanglement, and color palettes seen in the ethereal religious paintings of Pontormo and Tiepolo. I have recently found a renewed interest in the stark, abstracted realities of Georgia O'Keeffe. 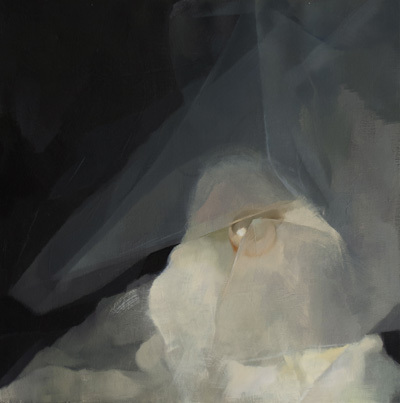 I am attracted to her use of flat shape, dramatic cropping, and her blurring of boundaries between landscape, still life, and abstraction that are particularly present in the animal bone series, where close-ups of familiar objects become strange and serene landscapes. Outside of art history, my work draws from a number of influences including contemporary design palettes, theater, and the ballet. I grew up in the house of a dancer, so the costumes and artifice of ballet have left a big impression on my aesthetic. I view representation as both a personal challenge and an ode to what I am depicting. I delight in the thingy-ness of things—the way they sit in space, how much they weigh, how light plays on them and moves through them, their colors, their textural quirks and particular tangibility. This page will serve as Manifest's MAR document for Christina Weaver's Residency. We will occasionally update it with news, studio pictures, and works made while at Manifest. The images pictured at right are a sampling of those submitted with her application. Information on how to apply for future MAR awards can be found here.